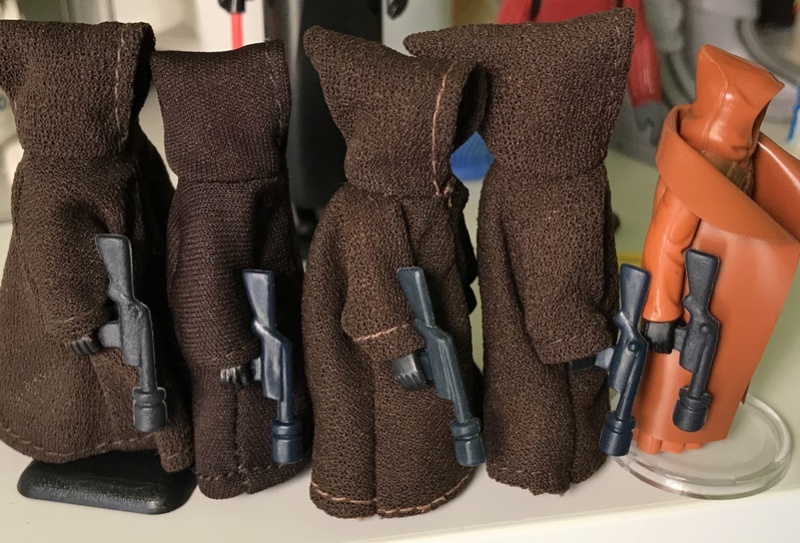 I'm trying to match my POTF jawa to his correct weapon variation - does anyone know which variation(s) have been verified to belong to the POTF "smooth" cape jawa? blue/black, blue, button/no-button, smooth, rough ... ?? Any evidence from carded examples out there would be great. I am no expert when it comes to weapon variations, and I do not have a POTF carded Jawa, but I did happen to have a carded ESB Jawa from 1982... I do not know if the process of elimination will work, but I figured I would photograph it and see if it helps. Since I already had to take some pictures I figured I would get photos of the card and figure in addition to the weapon. Hope this helps, if not my apologies... and maybe it will help someone else at some point? Er, yeah, perhaps "light blue" isn't the best description. I meant the smooth more intense blue (second from the left with the POTF smooth cape jawa). @Danny - your moc looks looks like my #3 figure, and #4 weapon so I think I'll match those up, so thanks for your pictures! Sadly I have no idea which of these actually came with the figures anymore. I just know my Vinyl and POTF came without weapons at all. Mat, I love the Jawa photos man! I should check out my loose Jawas and see what I have... Thanks for posting the pics! Please let me know if there are any photos of carded figures that I can help with in the future... I have been collecting on and off for about 14 years, so if it is something that I have in my possession I will be happy to snap some pics. I am not sure what is to be gained from the photos, but I personally love looking at pictures so I did not mind taking them, Thanks! I think that's a fantastic idea! If we set a standard of what the pic needs to show, angle etc... that would be very valuable in matching figures with correct accessories variations, and clearly since our google searches turned up nothing useful then this is not something that's been attempted before. Leave it with me, I'll consider what "standards" need to be put in place, check with the TIG Admins and we can start a thread. Hey! wow, awesome pics too! Looks like you have many of the weapon, hood (small, large etc..) and stitching variations too. Can't believe I'm about to admit this but I bet I'm not the only one - I have a spreadsheet with every figure, coo, accessory version etc... that I own , so these guides are crucial. My coo's in the picture I posted (left to right) are #4, #5, #1, #1 & I don't have the vinyl catalogued yet but he should be a #1 (Europe) or a #4 (North America). This is the current coo guide we like to point people to. Thanks Bryan, I just book marked it. That other link is an old link that has issues surrounding it that we would rather not get into. Please for future reference let's use the new guide I linked above for the time being. Thanks. Thanks for the correction Bryan! noted for future reference. I also should note that reading huge red bolded pieces of text at the top of a page is valuable, especially when it says things like "info in here can be inaccurate, please use this one ..."
Nice photos of the jawa. I wish I had one carded. I was able to post pic in my gallery. Trying to post from my iPhone but cannot attach pics proper. I think you can view pic in my gallery. I will get it figured out!